The thing about deciding to make a lot of the things for one’s wedding means there isn’t much time to do other stuff. That’s okay though, I’m having fun. My dress is almost done. I had my mom and grandma help me fit it so that all I have left to do is sew the neckline/back seam and attach the little hooks to close it. I have some really small white lace that I could use to finish off the neckline, but I haven’t quite decided yet whether I want the neckline plain or not. 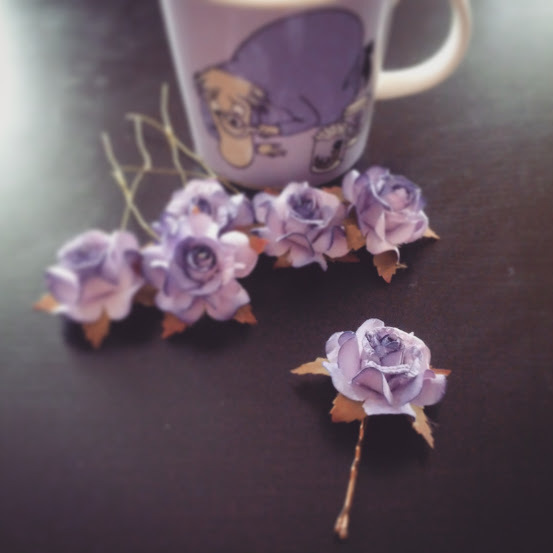 I was wandering around in HobbyCraft yesterday with one of my bridesmaids (we were looking for supplies to make the table seating plan) and I found purple paper flowers. I was going to buy my wedding hair accessories off Etsy, but after having a look at the back of the flowers in the pack, I decided to give it a go myself. So far, so good. Four down, two to go! Other things that have been distracting me lately: knitting a baby blanket for my nephew! He’s expected in mid-September, so I’ve still got some time. The squares in the Tamarix Quilt are so addictive. I’m already at 42. The geek in me would like to leave it at that, but the perfectionist in me won’t let me. So it looks like all 100 squares will be knit. Hopefully before the little man arrives. And of course, xBox games and Instagram. My youngest sister convinced me to reactive my Instagram account, so if you want to see random things I take pictures of, go find me there. As for the games, we recently started playing Badlands (so much fun, but man my fingers cramp up after awhile) and Lego Jurassic World. Which of course has led us to rewatching the movies. Can’t wait to actually see Jurassic World, but I don’t think I’ll be going to the cinema to see it. DVD/Netflix is a lot easier since I can knit at the same time. This entry was posted in Knitting, Personal, Sewing and tagged baby blanket, hair accessories, knitting, paper flowers, Tamarix Quilt, wedding. Bookmark the permalink.